NICVA is delighted to announce Two Castles Community Development Association as the winners of our Sector Forecast Survey prize draw. NICVA recently conducted their 2016 Sector Forecast Survey which explored the economic, political and operational issues facing the sector. 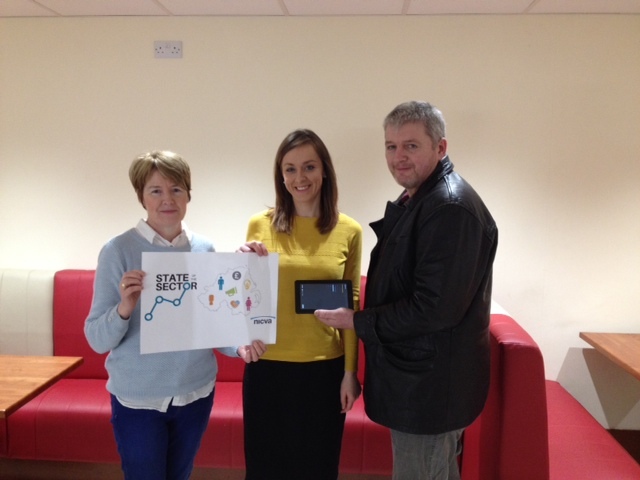 The prize draw winners were drawn at random from a pool of 944 organisations that responded to the survey with the winners, Two Castles Community Development Association, receiving an Amazon Fire Tablet. Two Castles Community Development Association is a small community group based in Newtownstewart, County Tyrone. The Association promotes community cohesion by organising a range of cultural and social events throughout the year. The Association also works to improve services in the village and is currently advocating for the development of a new playpark in the Mourne Park area. The group consists of seven committee members who meet once a month on a voluntary basis. One of the main events organised by the Association is an annual festival in August which consists of a wide variety of activities including a tractor run, children’s athletics and treasure hunt. Funds raised through previous festivals have been donated to local community groups such as sports clubs and playgroups. The festival attracts people from across Tyrone and Armagh and, as it enters its fourth year, continues to grow from strength to strength. To find out more about Two Castles Community Development Association please contact Ethna Conway ([email protected]) or John Gallagher ([email protected]). NICVA would like to thank everyone who took the time to take part in our Sector Forecast Survey. Results from the Survey will be presented in NICVA’s State of the Sector 7 report due to be published later this year. For more information about NICVA’s research programme please contact Rachel Shannon.